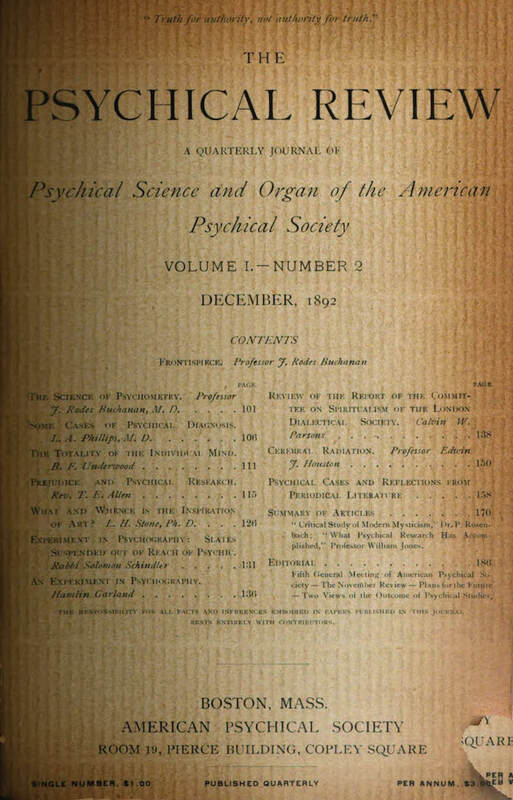 A Quarterly Journal of Psychical Science and Organ of the American Psychical Society. Boston, then Grafton, MA. Publisher: American Psychical Society. Editor: Rev. T.E. Allen. Corporate author: American Psychical Society1/1, August 1892-2/8, May 1894. 100 pp., 6 x 9. $3.00 a year. This was the journal of the American Psychical Society, which was founded in Boston in 1885 by Allen with the specific intention of supporting the “spiritualist hypothesis,” something that he and others felt was being neglected by the Society for Psychical Research. Allen was the secretary of the society and the editor of the journal, both of which collapsed from lack of support, financial and otherwise, from the public, including wealthy spiritualists whose support had been expected. Regular frontispiece engravings or photographs of notable researchers such as the Savage, Benjamin Orange Flower, B.F. Underwood, Hamlin Garland (an investigator for the society), J. Rodes Buchanan, et al., and contributions by the same and by Lucinda B. Chandler, Hester M. Poole, Giles B. Stebbins, James R. Cocke, and J.C.F. Grumbine. NYPL; Buffalo and Erie County Public Library; Columbia University; Cornell University; University of California, Berkeley; Yale University; Newberry Library; Northwestern University; etc. Microfilm, University Microfilms, Ann Arbor, MI; LOC; Wisconsin Historical Society.